Segway Rotterdam guarantees an active, dynamic company outing. Select the tour which will fit your company outing best and complete your outing by selecting one of our combinations. Max. 9 Segways per guide will depart. For larger groups we offer various combinations or the Segway Workshop. Groups from nine persons may choose their own tour. Segway Rotterdam has developed various tours. 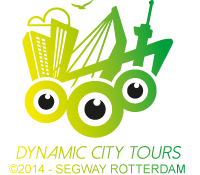 You can add various combinations and arrangements to your Segway Rotterdam group outing. Lunch, dinner rum tasting, high tea or coffee with pastry is offered by Restaurant De Zwarte Zwaan, situated next to the point of departure in the Parkhaven. Besides, Segway Rotterdam offers arrangements and combinations with the most wonderful attractions in Rotterdam. Also check www.zwartezwaanevents.nl for even more water adventure! Zwarte Zwaan Events organizes any possible water adventure for group outings, varying from a single adventure to complete arrangements, from a Rotterdam Tour to action & sensation, from hilarious games to meeting arrangements. Zwarte Zwaan Events offers arrangements for any group in any price range.